Saturday 1 and Sunday 2 April 2017 will see children and adults of all ages wearing wellingtons through the city centre of Bristol, as the Harbourside attraction welcomes visitors to wash their wellingtons. Wendy’s welly wash weekend is to encourage families to check, clean and dry their wellingtons when out and about to stop the spread of invasive species. 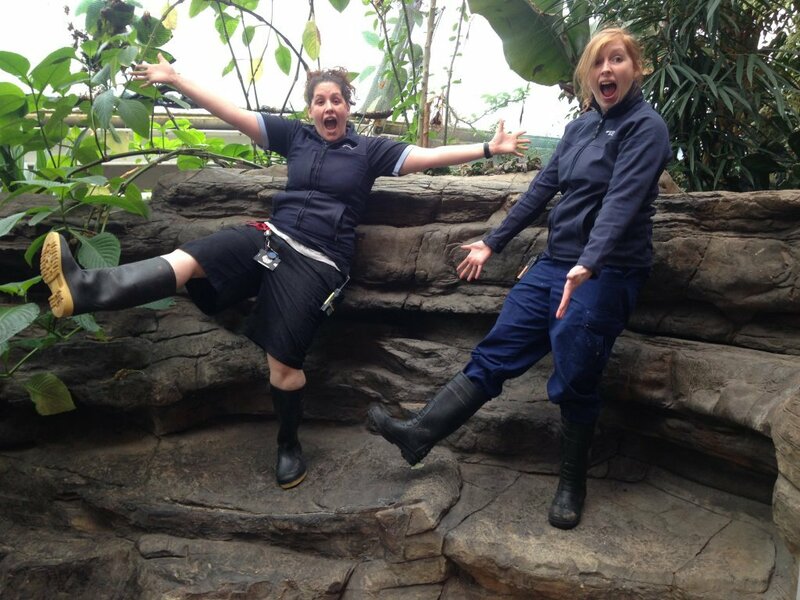 Tamara and Rachel ready for welly washing fun! The weekends’ activities include a ‘muddy puddle’ where visitors can get their wellingtons nice and dirty before learning how and why to clean them off again. The event at Bristol Aquarium marks the end of Invasive Species Week held by GB non-native species secretariat. *Offer of 15% off for any visitors wearing wellingtons is valid for Saturday 1 and Sunday 2 April only, terms and conditions: Not to be used in conjunction with any other offer, family tickets or e-tickets. You must be wearing your wellington boots and mention this to staff on arrival. Photographs will not be accepted. This offer has no cash value. Displays, talks and feeding demonstrations are subject to change. Valid 01/04/2017 and 02/04/17 only. Issued by Bristol Aquarium. For more information and to arrange interviews and picture opportunities please contact Hannah Worrall or Wendy Desyllas on 0117 929 8929.